How To Save Money in Dubai, seriously! Dubai is a big stopover destination for travelers flying Emirates Airlines as they transit around the world (or Etihad passengers if they decide to visit from Abu Dhabi). As explored the city, I was shocked at the cost of everything — from taxis to dinners to basic goods. The rumors I heard were true: Dubai was expensive. But like every destination (except maybe Bermuda), there are plenty of ways to save and visit on a budget if you look beneath the surface. 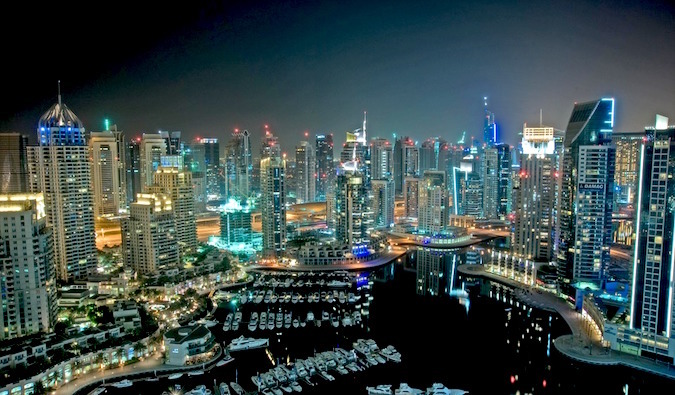 Dubai doesn’t have to bust your budget but it easily can if you aren’t careful! Like most cities with extremely high prices, many of the city’s residents have found tips and tricks on how to squeeze every last dirham possible. Use Groupon – Groupon is huge in Dubai, and you can find tons of discounts, 2-for-1 specials, and deals on the website. If there is something you want to do, check there first as there is a high chance you’ll find a discount. Get The Entertainer – The Entertainer, a magazine found in many countries (even in the Maldives! ), offers discounts and specials on restaurants, hotels, and activities. There’s one for the UAE that all locals swear by. You’ll get 2-for-1 specials and discounts on attractions, restaurants, drinks, clubs, them parks, and hotels. You can pick up a copy when you arrive in Dubai at supermarkets and bookstores, or find an online version on their website (the app costs 445 AED or $121 USD). The hard copy costs 495 AED ($134 USD) but can quickly pay for itself. Find a cheap brunch – I strongly advise attending brunch, as it’s a tradition among locals in Dubai and quite fun. Every Friday, locals flock to a midday buffet of unlimited drinks and food. As the day goes on, it often turns into debauchery that would make Nero proud. However, brunch is not a cheap affair, with some costing as much as 700 AED ($190 USD). Therefore, knowing where the deals are very important. Tenth Street is only 295 AED ($80 USD) for unlimited food and drinks (which you can order multiples of at a time). Warehouse, Rock Bottom, and Waxy O’Conners are also cheap. For a good alcohol free brunch, try More or Beirut. You can ask people on Couchsurfing too. There’s an active Dubai group on the site. Moreover, check out the app Guzzler, which also lists the current best happy hours in the city. Get pizza for lunch – Tucked into The Dubai Mall — near the entrance used to go to the top of the Burj Khalifa — is a place called Debonairs. It’s located right in the food court on the ground floor and has a pizza-and-drink lunch special for 15 AED ($4 USD). It’s one of the best bargains I found. The pizzas are small (you can upsize for 22 AED ($6 USD)) but filling enough for lunch. Eat in old Dubai – Step away from the hotels, malls, and fancy souks meant to make you think you are in Aladdin and head into Old Dubai for cheap eats. Meals at restaurants in this area generally cost 20-30 AED ($5-8 USD). I really loved Al Usted, an Iranian restaurant near the Al Fahidi metro. Take the metro – While the metro only really cuts through the middle of the city, it does go to the marina, airport, and Old Dubai. At 8 AED ($2 USD), it’s cheaper than any taxi. If you have to go somewhere away from the metro, take a taxi from the metro stop nearest your destination. You’ll save time and about 30 AED ($8 USD). Otherwise, most taxis are 40-60 AED ($11-16 USD) for anywhere in the center of town. However, if you lack hotel points or simply don’t want to stay in one, there is a very active Couchsurfing community in the city. I would definitely recommend contacting residents before you visit and see if anyone has a room. Very basic hotels can be found for $40-50 USD per night on Booking.com and on Airbnb the private rooms in the $35-45 USD range (if you’re new to Airbnb, get $35 off your first stay here). Skip the booze – Outside the happy hours and all-you-can-eat brunches, drinking is expensive ($10 USD beers, $15 USD glasses of wine), so I would go easy on the drinking during your visit. 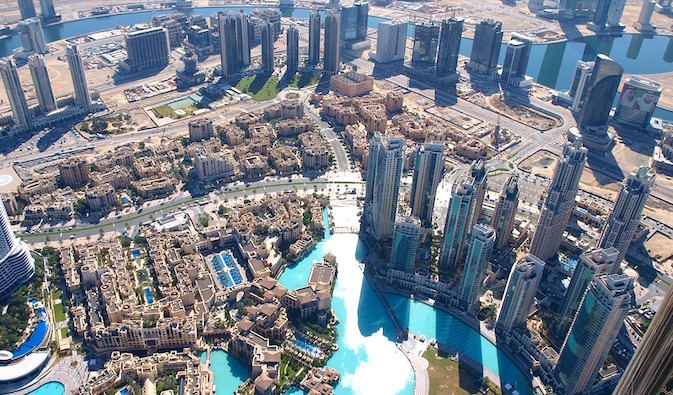 Burj Khalifa – The tallest building in the world lets you go up to the 128th floor for 100 AED ($27 USD). From there, you get panoramic views of the city and desert. When I went it was pretty hazy, but it still made for a beautiful contrast. I would highly recommend it (but don’t pay 500 AED ($136 USD) for the 148th floor. It’s not that much of a difference!). At night, the building is illuminated by a spectacular light show of fish, palm trees, and other scenes while the fountain below dances to music. The Dubai Mall – This was one of my favorite malls simply for the cool aquarium, ice skating rink, movie theater, large bookstore (though it didn’t have my book), and all the little cafés that dot the mall. It’s worth a wander. You’ll see a lot of people just hanging out here, drinking coffee, reading a book, chatting, and escaping the heat. 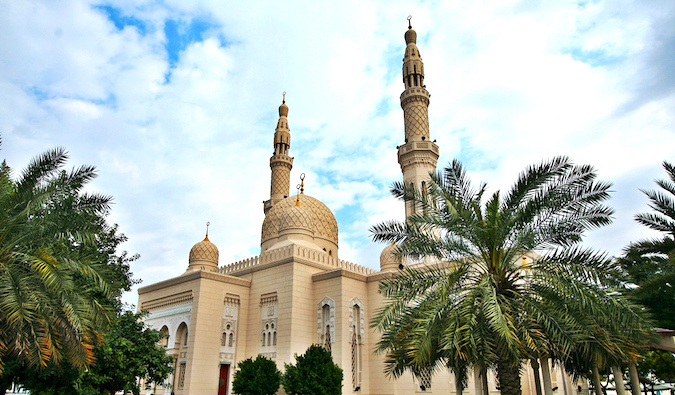 Jumeirah Mosque – This beautiful mosque is one of two in the city you can actually visit. It’s small, consisting of one large room but there is a guided tour take place each day at 10am. It’s 20 AED ($5.50 USD), comes with a great breakfast spread, and is more cultural information on Islam than a tour, but if you don’t know much about Islam or the role it plays in the UAE, it’s pretty interesting. The Marina – The marina area is surrounded by tall buildings and contains a beautiful boardwalk. You can see the fancy boats and get some stunning photographs of the harbor and skyline. Be sure to checkout Pier 7, which is seven floors of restaurants and bars on the water. I liked Asia Asia, with its gaudy Asian theme (it has 2-for-1 specials in The Entertainer too!). Souk Madinat Jumeirah – This souk (market) is a modern building designed to look like something out of Aladdin, but it’s home to some incredible restaurants, like Agency, a modern wine bar with a huge selection of wines and yummy meat and cheese plates. There’s a beautiful inner courtyard pond in this complex, too. Dubai Museum – A small museum in Old Dubai with not a lot of information but some really cool displays. It teaches you the history and culture of Dubai and life in the desert. At $1 USD admission, you can’t go wrong. Old Dubai – This is Dubai as it used to be. Markets (like the famous gold market) pepper the area, small merchant shops line the streets, and you can get lost in a maze of alleyways! Take a boat across the river, wander aimlessly, visit the Dubai Museum, eat at some of the traditional restaurants (there’s also a lot of good Indian food here), explore the art district, and see Dubai as it is away from the glitz of the malls and high-rises. Visit the desert – I didn’t get a chance to do this during my visit but everyone – from friends to travelers to locals – said this is one of the best things to do in Dubai. Take a day trip or spend a night out in the desert. It’s supposed to be beautiful.